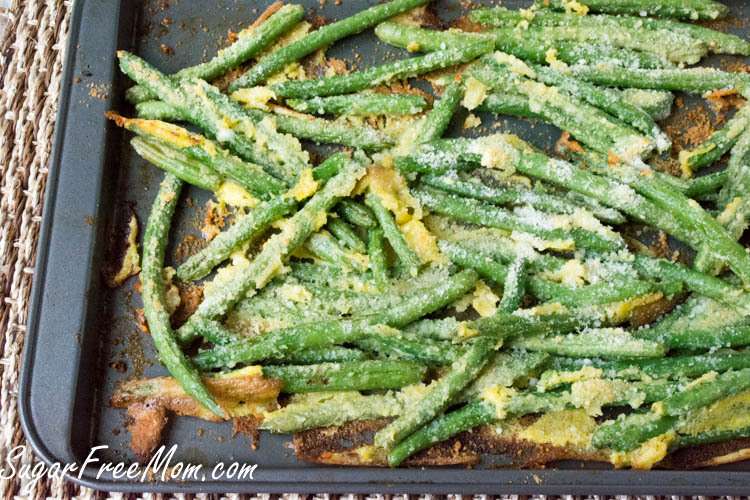 These luscious looking cheesy, garlicky green beans are baked not fried and full of flavor! 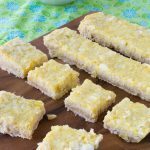 Low Carb, Gluten Free, Grain Free and ‘Lick -Your- Fingers’ Good! What does it take to get my kids to eat vegetables? CHEESE! If you’ve followed me long enough you know I’m all about that cheese! From Bacon Cheeseburger Cauliflower Casserole, to Cheesy Cauli Tots, Cheesy Zucchini Bites, to Cheesy Antipasto Stuffed Chicken, it’s always going to win my family over with cheese in it! These wouldn’t be their typical choice for dinner, after all, they are children and would prefer french fries! But I had to try. I even told them they were a new kind of french fry! They didn’t buy that, but they did all enjoy the green beans and my youngest even asked for seconds. So to me that’s winning! I can’t tell you they crisp up like a french fry because obviously they are baked not fried, but they are finger food material and it works for us as a simple side for dinner. 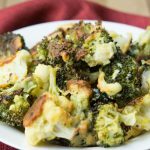 This recipe is adapted from my Oven Fried Parmesan Broccoli & Cauliflower florets which my kids love, even the cauliflower! I figure you can serve most any veggie with some cheese and it might win my kids over, maybe yours too! 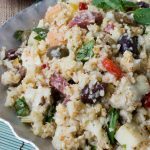 Easy, simple, serving up a healthy veggie in minutes………my kind of side dish, hopefully yours too! 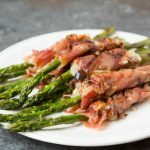 If you’re looking for more green bean sides dishes, check out these Roasted Green Beans with Parmesan and Basil, or these Bacon Green Bean Bundles, or even these Green Beans with Brown Butter, Crispy Shallots and Hazelnuts! This recipe was first posted in November of 2014 and I added a video to it and brought it out of the archives for all of you who may have never seen this awesome recipe! Hope you enjoy these as much as we do! In a large bowl whisk the oil, garlic, egg and salt together. Toss in the green beans and coat well. 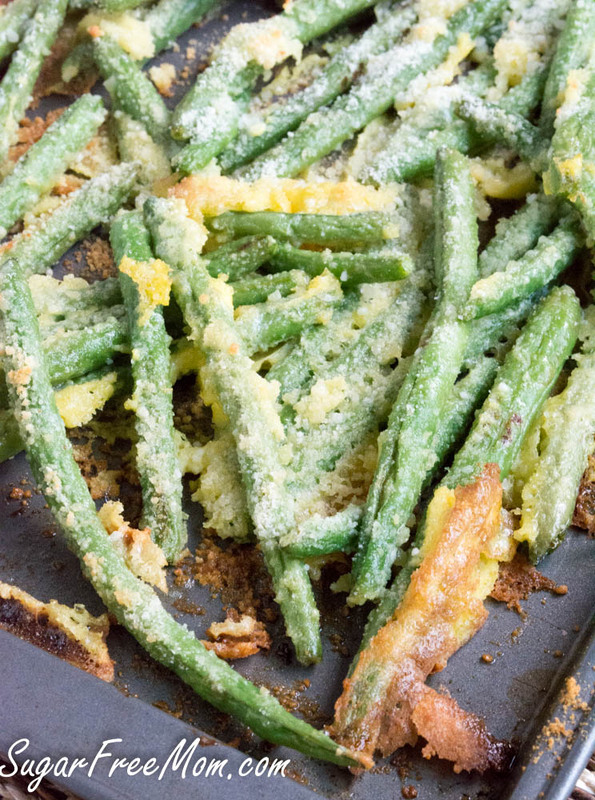 Sprinkle in Parmesan on the green beans and toss gently. Place evenly on a greased baking sheet. To crisp, heat for a minute or two under broiler. These sound fantastic. Green beans are something that our family can agree on. Pinned! Wouldn’t make again. Parmesan did not stick to beans, melted and stuck to pan. Maybe if you sprinkled cheese after they baked and just before serving. Rated fIr at best. use a silpat silicone pan liner or parchment. i stirred around a little to evenly distribute eggy cheese. after broiling just break up crispy bits & distribute. Super delicious! Oh my gosh don’t these look divine! This is such a fun idea, and I know these would be gobbled up in an instant! I just love green beans as a side dish. Thank you so much! I love this oven fried green bean. Green beans used to be out go to veggie for years. My son loves them. Bookmarking this recipe. My kids love these. I’ve had them at restaurants but not at home. Time to change that! I love this veggie dish!! This would be a great side for any meal. I firmly believe that any veggie is significantly improved by roasting. However, I have never tried roasting green beans before. I will have to give this a shot! We eat a LOT of green beans in our house. A lot. And yet I’ve never tried them like this. Definitely making this soon! I love this preparation – roasted veggies are a fave – with Parmesan and garlic – even better! <3 these totally make my heart skip a beat! I need to make them soon! I made something like this a few years ago but I can't wait to try your version! I bet it's even better! Oh man, this is amazing. I could eat these all the live long day. 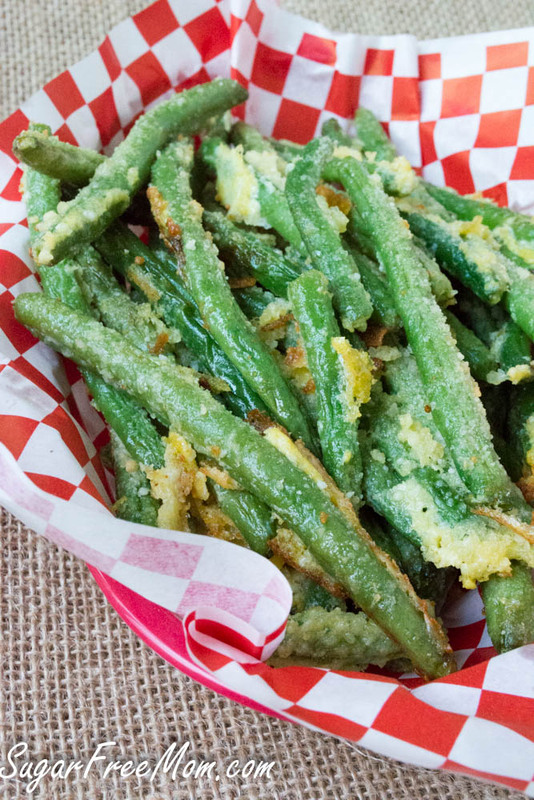 I love garlicky green beans – I think they’r my favorite vegetable. I never thought to bake them though. Will have to give this a try! 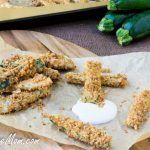 I LOVE roasting green beans and these look incredible with that delectable coating. YUM! I am so excited right now! We are giving up potatoes… and I have been stressing about what to serve along side cheeseburgers instead of French fries. My son does not like butternut squash (weird kid) and that’s the only other thing I could think of. We eat a lot of broccoli and cauliflower already. This seems fast too! Faster than fries! Thank you for sharing! 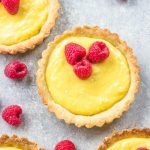 These look yummy and easy!! Thanks for sharing that, I was thinking about using foil!! Did you use whole beans or did you split them in half? How do the fresh green beans cook so fast? I thought fresh beans take a long time. Oh my god, such an awesome snack. 🙂 I’ve already tried out yesterday, and it became one of my all time favorites. Thanks! This ssounds great. I’m going to try it tomorrow night! Did you take the beans out of the egg/olive oil mixture? Thank you so much for sharing this recipe. Green beans are so etching we do not eat a lot of because I don’t like the taste of canned food. However, once I saw this I couldn’t wait to get some fresh beans on my next grocery run. Made tis up with grilled thick pork chops. My husband and I both loved them. Thanks again. Tried these tonight. Tasted great but didn’t look like picture, maybe because I halved the recipe? Will use these for my crab feed. Made these tonight. No complaints. would love to make this tonight, but only have frozen green beans. Would that work at all? I’ve not tried it with frozen so not sure sorry. Do you cook the green beans in advance? Followed the recipe from start to finish including broiling, though they brown, the were not crisp. All was not lost. I saved them and made them for a side dish for dinner. Hi! So excited to try this recipe out!! I plan on making them for my company potluck, any recommendation on reheating or prepping this dish to be served the next day? 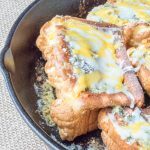 This recipe was amazing and so easy! I baked the beans a few minutes longer than suggested and they were wonderfully crispy.! Thanks for a great recipe. I made these this evening. They turned out tasty, but not crispy, even after I put them under the broiler..
Any suggestions? I followed the recipe. They won’t be as crispy as you are expecting, the only thing you could do is fry them in oil instead of bake them. Sorry if this appears to e a dumb question, but, were the green beans fresh or can they be frozen and thawed? Mine were fresh, I’ve not tried it with frozen. I could have some too. Great recipe . I didn’t change anything from your version. 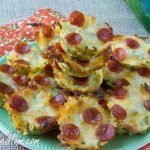 These were fantastic, will be making them as a weekly staple side dish. YUM! Would you know he containers value of these on the 21 Day Fix? Thanks! I have made these over three times now for myself and my boyfriend. I normally really hate green beans but these are the best green beans ever! I love using raw garlic cloves versus minced garlic. And all-time favorite veggie. I just made these with green beans fresh picked from the garden. Substituted Romano cheese or the parm and added some seasoned salt with garlic powder. They were a big hit! Yummy! How do you make for 10 people?? Hmmm…sounded great and looked yummy, but I ended up with scrambled eggs amidst my beans. Doesn’t look anything like your photo. I mixed salt, pepper, olive oil, egg and fresh garlic with a hand blender, tossed the beans in it and discarded the excess. Grated parmesan on top as per the recipe and it came out perfect! These were amazing! I made them tonight and everyone loved them including my husband, 8 year old and 1 year old. This is going down as one of our favorite side dishes. Hubby and the 15 yo DS loved these. Both guys cleaned these up! Cooked for an extra min. or 2 and used Parchment Paper as recommended. Definitely will be doing again and thinking of some change-ups; thanks to Brenda’s creativity. These were fabulous! Followed the recipe EXACTLY and they were perfect. My son even went back for a giant plate of seconds…of VEGETABLES!!! He doesn’t even like parmesan but he liked it here. We were thinking of adding a little panko for extra crunch next time. Some chopped pecans or sliced almonds would be good too. Not sure if I should mix them in with the egg prior to roasting or toast and sprinkle afterwards. I want to make this recipe as well…. it sounds so yummy. I too was thinking of adding some panko. Maybe mixing the parmesan and panko together to sprinkle on near the end. Has anybody tried this? Interested to know if the panko will stick to the beans to make them more chip like. 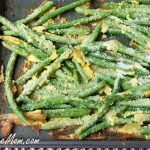 Can you do this with frozen green beans/how would the bake time change? I think you could but I would say you’d need to thaw them so the coating would stick. Could this be done in an air fryer? I don’t have one, please let me know though if you try it. Made these last night… screwed up the recipe as always. I mixed the cheese in the egg/olive oil/garlic mixture and tossed the beans in that. It was still great. I will try it the correct time next time and see if it matters. Not crispy but the cheese bits were. This looked delicious but all I have to say is “ick”!!! Sorry you were disappointed, we love them and scrape and eat all the yummy bits off the pan! 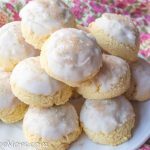 Made these tonight and they were delish! I sprayed the pan with oil before I cooked them and sprinkled a little extra parmesan on top. They stuck to the pan a little and not as crispy as true “fried” green beans, but not even my 6 year old cared. He gobbled them up right along with the rest of us. I think these will become a regular on our menu. 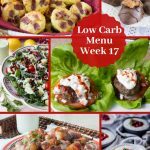 Thanks for a great low carb side dish! How do I describe this recipe? Salty scrambled eggs on mushy green beans. Might as well have made an over-salted green bean omelette. I absolutely love green beans I actually eat them two a week! This is a must make!